Day: Wednesday, April 24, 2019 NOTE: this event has already happened. Syracuse (and all of Central New York State) takes part in Drive Electric Earth Day, a free event held in the ESF quad in conjunction with the SUNY ESF Earth Week 2019. Come join us and visit the ESF Farmer's Market while you're there. The event is open to the public. EV owners should arrive at 10 am to set up. 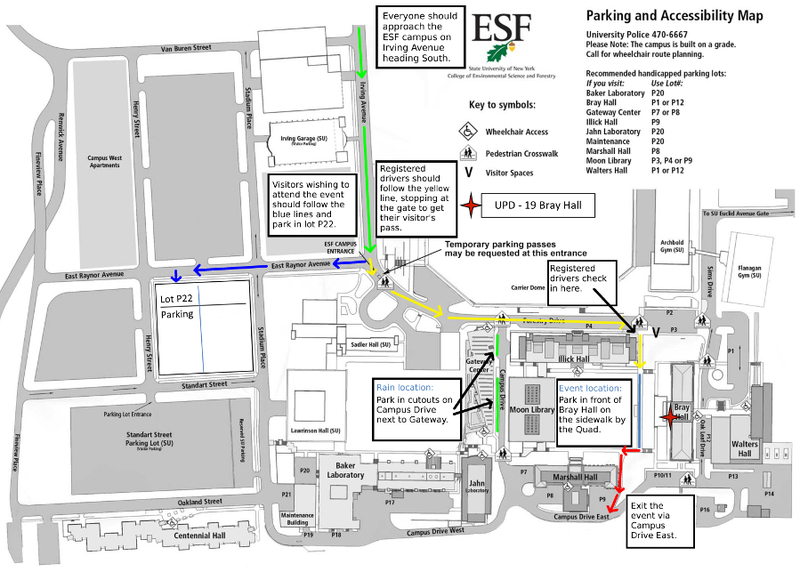 Everyone coming to the event should head south on Irving Avenue to get to the ESF campus. (see map below). Registered vehicle owners should first check in at the gate at the entrance to campus then follow the instructions on the map below. The public can park in lot P22 and walk up the hill toward Bray hall (see map below). Registered owners - Please also considering registering for the Cazenovia Event on April 13th and the Skaneateles Event on April 27th. Please join us for a presentation on Plug-in vehicles in the Library across the Quad from Bray Hall at, or shortly after, 2 pm. Registered attendees report 106,219 electric miles driven.